If you’ve ever inquired about an outdoor family session with me, you know that I recommend shooting during Golden Hour, one or two hours before the sun goes down. But did you know, there is another Golden Hour? Yes, there is, and it happens the first hour or so after sunrise. Now, I’ll be completely honest and tell you I have typically preferred to shoot in the evening, because, I’m just not a morning person. And sunrise happens really early. And on weekends, I enjoy sleeping in, lounging in my PJs and drinking like 17 cups of coffee. But I recently had to reschedule a family session due to a bit of uncooperative weather, and the only time that worked was…you guessed it…morning. Besides the amazing light, there are several other reasons that I am now in love with morning family sessions. Do you have kids that NEVER let you sleep in? Then a morning family photo session might be right for you! A lot of kids are early birds (I’m looking at you babies & toddlers!). They are up at the crack of dawn and ready for action. Morning is their happy time, and this translates to wonderful, happy pictures! This is not to say you can’t get wonderful, happy photos in the evening. I still love shooting in the evening, and if your kid is a night owl, like mine (I think it’s genetic), then you're golden. But often, little kiddos are early to rise and early to bed. In that case, a morning session might be right for your family. This little guy was definitely happy to be at the park on this beautiful fall morning! Public parks in the Rochester and Metro Detroit can get really busy. But when you arrive at sunrise, you will barely bump into anyone. I’m not anti-social or anything, but I do love having free reign of the space in which I’m shooting. Less people means less of a chance of photo-bombers. This beautiful path probably would have been full of joggers, walkers and bikers later in the day. But in the early morning, we had the place to ourselves! Every minute is precious during golden hour. When you shoot in the evening, eventually you run out of light. In the morning, you are gaining light every minute, which means we can shoot as long as needed to capture all the photos we want. Of course, as time goes on, the sun will move overhead and give us more harsh lighting, but that’s when I seek shade and we're able to capture a few more shots. This adorable picture was taken towards the end of our session, after the sun had gotten pretty high. We laid this cutie down on a blanket under a tree and, with the help of her daddy, captured some adorable baby smiles. Morning photo sessions are awesome because you are finished early and still have the entire day ahead of you, so you can get on with your weekend! And if you have a baby/toddler, they will probably take the best nap ever! You can head home and make another pot of coffee. That’s what I did after this shoot! And of course, THAT LIGHT. As I said earlier, I’m not a morning person…it’s just not in my blood. But when I have a morning family session, for some reason I can pop out of bed no problem! And when I do get out to take photos in the morning, I realize what I am missing by sleeping in. 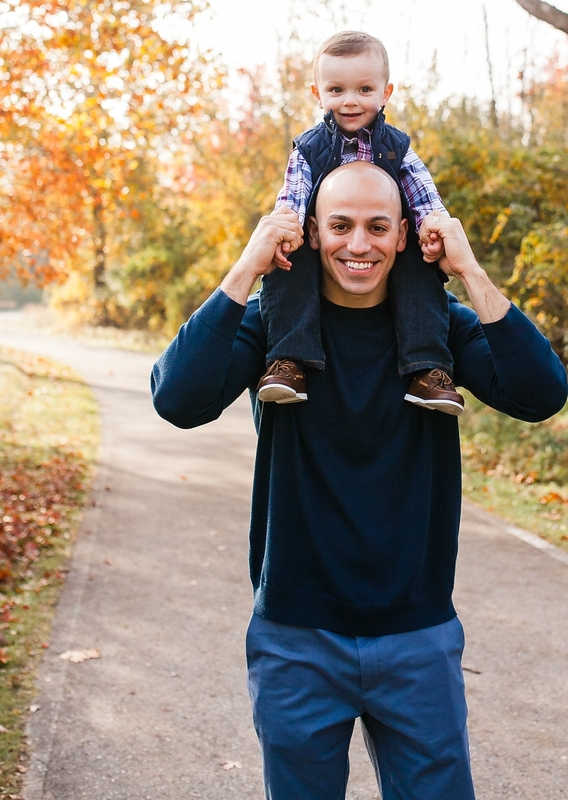 I know outdoor photography season is just about over for this year, but it’s never too early to get your family photo session on the calendar! Next year I’m making a pact to do more morning sessions. Who is with me?? 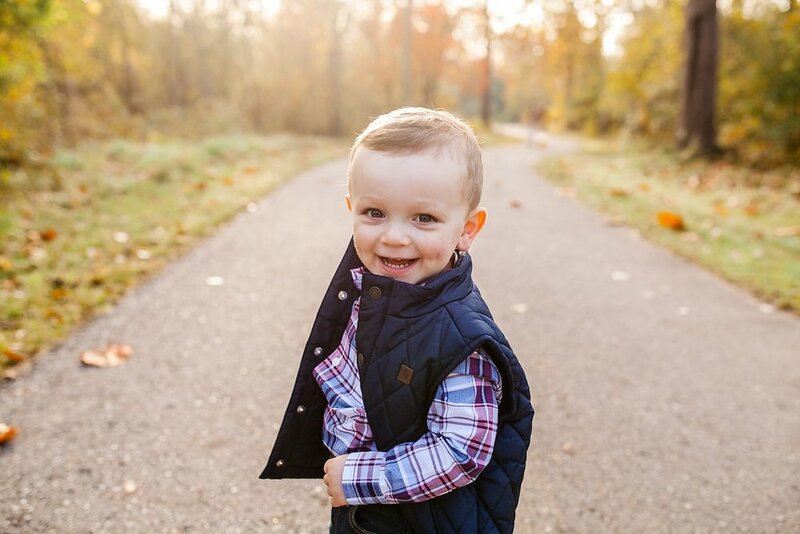 Denise Button is a child and family photographer located in Rochester, Michigan and serving the Metro Detroit area, including Birmingham, Royal Oak, Clarkston, Oakland Township, Bloomfield, Rochester Hills, Troy and beyond. She focuses on fun, lighthearted, candid moments and real connections.